The first time I’ve heard of Cursed Castilla was when Abylight Studios has announced the release of the 3DS version of the game back in July. Luckily I got the chance to play it on my 3DS and immediately fell in love with Cursed Castilla or Maldita Castilla EX in Spanish. Several weeks later I heard rumors about a possible PS Vita version and Abylight Studios began to ask the Vita community if it likes to see Cursed Castilla on the PS Vita. As I already was convinced from the 3DS version I supported a possible PS Vita release on Twitter as I thought it would be a great fit for the console. And it seems the overwhelming positive response from the PS Vita community helped that Abylight Studios decided to bring Cursed Castilla to our beloved handheld. Set in medieval Spain, Cursed Castilla tells the story of the brave knight Don Ramiro on his quest to finish the nightmare that has entered the lands of Tolomera. On his adventure he encounters various evil monsters and creatures that all seek after his life. Equipped with a different range of weapons, Don Ramiro’s goal is to banish all zombies and demons from the Kingdom of Castilla. While the story stelling throughout the game is spare, Cursed Castilla comes with a compendium where you can learn lots of things about the heroes, items and secrets. There is also some information about all the demons, beasts and magical creatures you will encounter. The game is divided into 8 different chapters with 4 different endings available. While the story won’t win an Oscar, it perfectly fits to the game’s medieval setting. 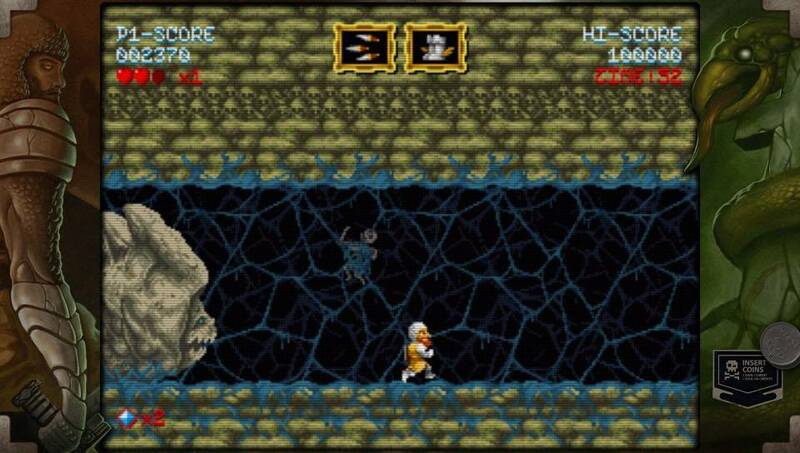 Cursed Castilla describes itself as a love letter to classic action arcade games from the 80ies and 90ies. 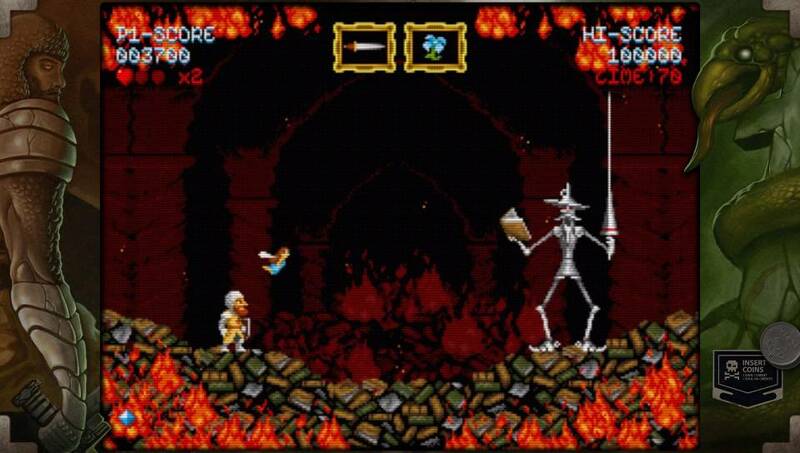 And indeed, the first time I played the game it felt like I was playing Ghost ‘n Goblins or its sequel Ghouls ‘n Ghosts. 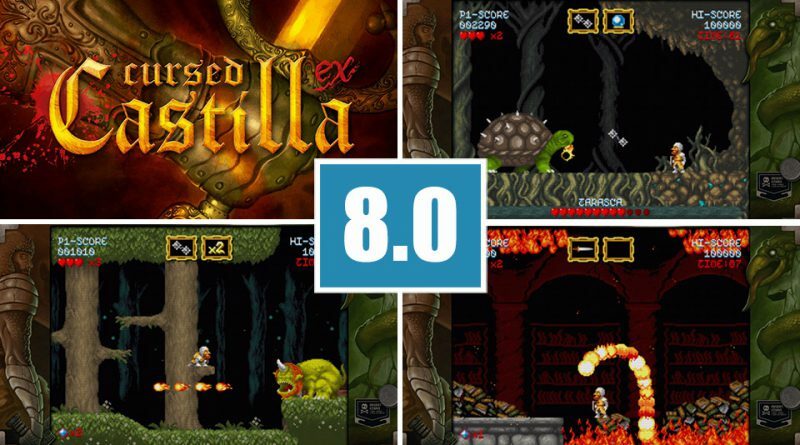 Thanks to the beautiful retro-graphics and its soundtrack, Cursed Castilla does a very good job in creating the atmosphere of those classic arcade games. As you control Don Ramiro through the kingdom of Castilla, you will meet hordes of monsters and zombies. By standard, your knight is only equipped with a knife but in each level you have the chance to get better weapons and enhancements by opening chests or sometimes by killing huge monsters. Once you get a weapon upgrade, you have to chose wisely as each weapon has a different effect on the approaching enemies. Enhancements are special features such as a Fairy that helps you in killing monsters or a neat double jump that lets you reach higher areas more easily. When an enemy hits you, you lose one of your hearts and when all are gone, you die and lose all your weapons and enhancements. This can become frustrating especially when you have been fighting against a boss. The good thing is that you don’t have to start the whole chapter again, you only will be teleported to the last checkpoint. When you have lost all your lives, the game is over but thanks to endless credits, you can start over and over again. The endless credits are really needed as the difficulty can become frustrating at times. 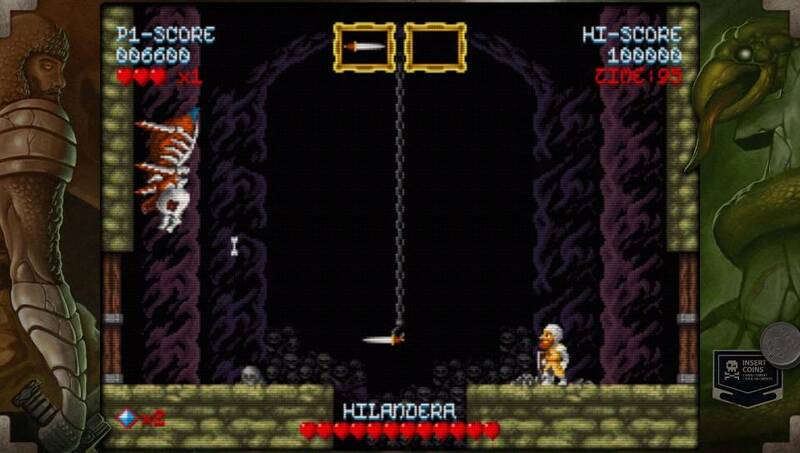 As Cursed Castilla is an old-school platformer, the gameplay consists of lots of try and error and only when you know the enemies behaviour and how to attack them, you will master a situation. For some players this can get frustrating but at the same time it’s rewarding when you got past an area. What’s really outstanding in the game are the various monsters and boss fights. Each chapter comes with a different setting and enemies and no boss fight is the same. Some of them are quite challenging, especially Don Quixote took me some time to beat him. Counting the boss fights, there are 19 with normally 2 of them in each chapter. There are also interludes between the levels to achieve a higher score or for extra lifes. Difficulty is generally high and most of the time fair, only in a few areas the combination between enemies and obstacles can lead to frustration. I needed around 4 hours to complete the game in my first playthrough but once you know how to deal with the enemies, this can be done much faster. There is also a speed run option which enables to show the playtime. As there are 4 endings and many secrets to unlock, the game has a good replay value. Cursed Castilla comes with beautifully created retro-graphics that perfectly imitates the arcade classics that it was inspired from. 4 different video modes allow to play in the original arcade mode or in three upscaled modes. Sadly, the upscaling causes some blurriness. While video modes 2 and 3 are fine to play, the widescreen mode does look ugly on the Vita screen and can’t be recommended to play. Technically, the game runs fine on the PS Vita with short loading times between the levels. Abylight Studios did a great job with porting the game to the PS Vita. The game’s medieval soundtrack fits to the game and each area comes with a different set of melodies. Only when you are stuck and can’t get past a stage, the music can get annoying but this is part of the gameplay experience. The game also has an option to listen to the soundtrack but only the tracks you already unlocked with your playthrough are available. 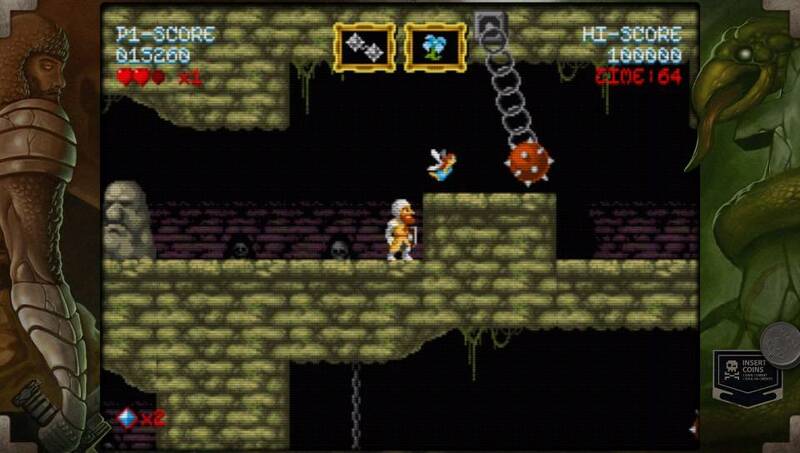 Cursed Castilla is a good and challenging retro-platformer that perfectly captures the spirits of old arcade classics. While it can become frustrating at times due to the high difficulty, it mostly offers a fair gameplay experience. 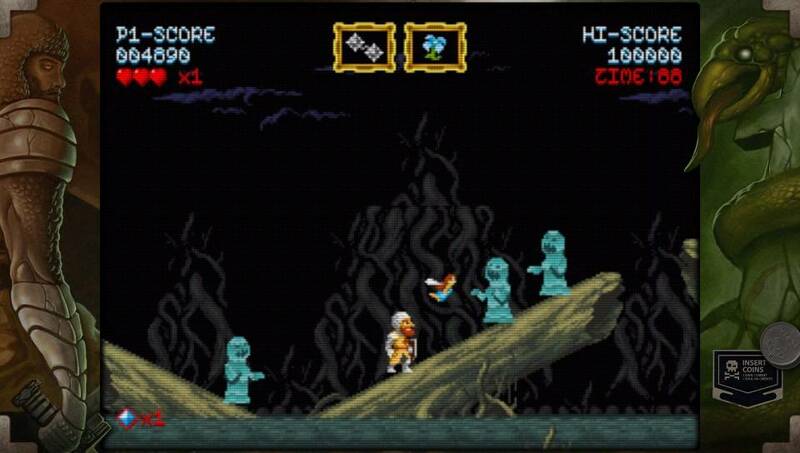 If you love games like Ghost ‘n Goblins look no further and get Cursed Castilla for the PS Vita.